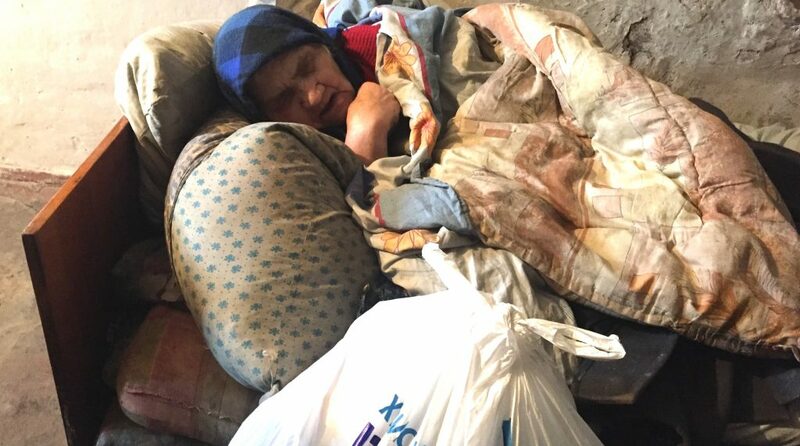 The circumstances under which some Holocaust survivors are forced to live in the Ukraine are dehumanizing. With your support, we can give them comfort and help. 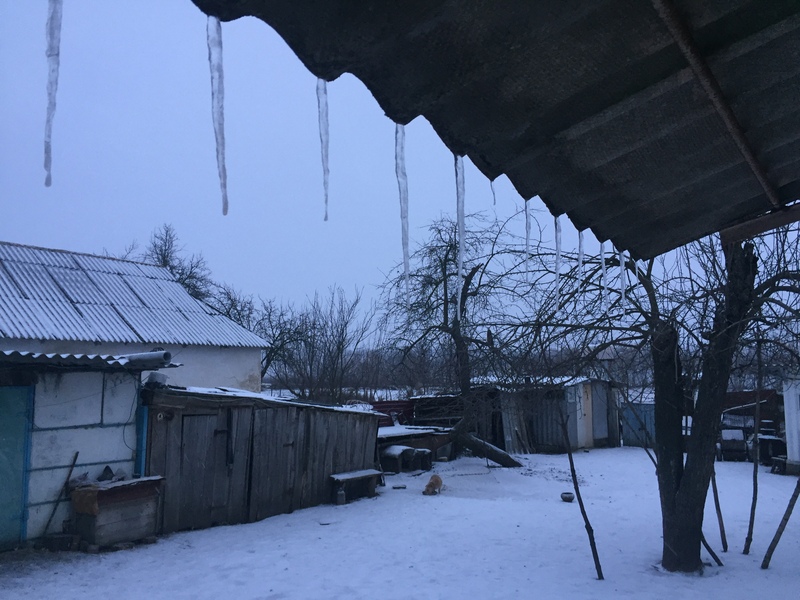 Shalom from the cold Ukraine! It is bitterly cold here in the Ukraine! Yesterday it was a frigid -19 degrees (Celsius). This makes the drives long and tiring. 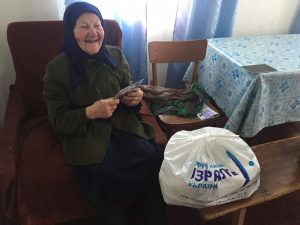 We are thankful that in the past few days we were personally able to bring food parcels to lonely seniors who live in remote villages in the Ukrainian countryside. The situation in which we found some of the seniors is dire. They live in extreme poverty, under terrible circumstances. The houses are cold and in disrepair. The icy wind blows right in through the chinks in the walls! Look how happy this sweet grandmother is! A food parcel provides that little bit extra that they so badly need to survive the winter. But these old ‘grandmothers’ are so thankful for our visits and attention. Thankfully they now each have a nutritious food parcel, enough to last through the end of February. We continue to provide seniors with food parcels, especially in the winter months. It is difficult but rewarding work, to be a comfort to His People in exile. But right now we have a serious problem: counting all the requests form the entire Ukraine (including the war zone in the east of the country) we will need six thousand food parcels to last through the end of April. At this point we still need the money for 5,450 of those. One food parcel costs 10 euros/12 U.S. dollars. 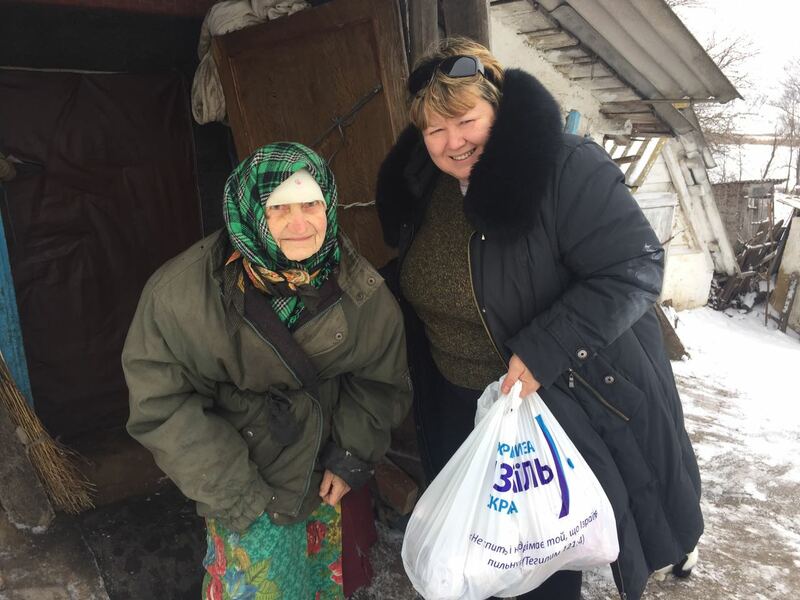 For that price you give a senior in the Ukraine an 11 kilo food parcel. This can literally be a matter of life or death. The parcel contains nutritious and healthy ingredients that they cannot afford to buy on their own. Our coworker Nataliya brings by a food parcel for a Holocaust survivor in the Ukraine. 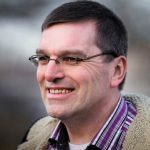 Will you please help? You can donate to the food parcel campaign by clicking the PayPal button below. And please pray for the Jewish community in the Ukraine.